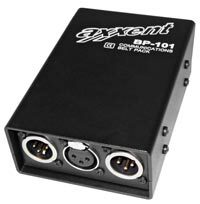 The belt pack BP-101 is a portable single channel intercom station. It is compatible to common Party Line Intercom Systems. All controls on the front side of the unit are identical to those on the main stations. Knob on right side is headset volume. The side tone is adjustable via slotted screwdriver. The talk switch has three positions: Middle is Off, Top is momentary "Push to Talk", Down is Talk (On). The BP-101 features light and sound alarm. Illuminated yellow pushbutton has the CALL function. The sound alarm is switchable. BP-101 features a connection (3.5 mm socket on left side of front panel) for external "vibration alarm module". When the plug of an external "vibro alarm module" is inserted, the internal buzzer is automatically disabled. Extended Mode (Lever Down): CALL Signal is pulsing and extended, ~ 4 seconds. 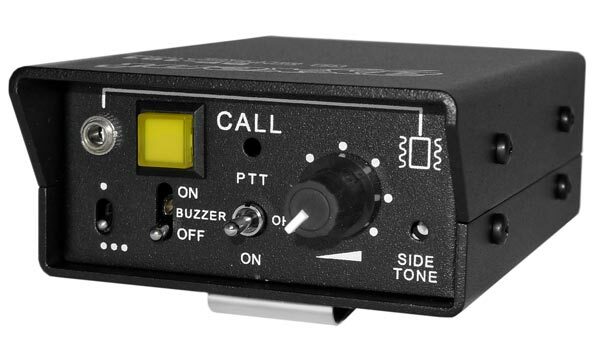 Instant Mode (Lever Up): Indication follows the CALL Signal on the Line. Then duration of the CALL Signal means the ATTENTION. End of CALL Signal means the Start of the Action. Three XLR connectors are easy accessible on the rear side of the BP-101 (the 4-pin XLR connector for the headset and 3-pin XLRs for Party Line). The integrated spring steel clip allows for easy fixing the unit to trouser belts.